Project 1612: How would you describe the art you make? Various finished and in-progress oil paintings. Steph: I consider my current paintings abstractions of Midwest nature. I shoot photos of plants and trees that I can see in my immediate environment. Using cropped areas of branches, leaves and shadows, as reference, I reduce each to the bare essentials of line, color, shape and light, independent of visual reference to the real. Steph: An absolute passion for the process. Project 1612: What role does photography play in your process? Steph: Photography has always been an integral part of my life. My grandfather was a photographer and I grew up with a camera in my hand. Until recently, photography and painting were separate processes in my artistic practice. With this current body of work, I am using my own photographs to inspire my paintings, merging the two for the first time. Project 1612: Tell us about the connection between your sculptural pieces and your paintings? Steph: My earlier sculptural work was also inspired by local nature. They were based on seed pods and regional colors. Project 1612: How do you factor color into your works, and what influences the color choices? Steph showing an older painting that has been stored behind her painting station. She explains how her past work has influenced her current body of work. Steph: I reference colors I see around me. I love the play of light on objects during different seasons. Project 1612: Explain the role shadows play in your work. Steph: Shadows can be evidence of an object, without actually seeing the source. I love that it is an additional step away from the reference to the real. Project 1612: What problems do you face in the studio? How do you overcome them? Steph: The biggest problem I face in the studio is time. I recently left one of the many jobs I worked to support my practice, to focus more on my art. Project 1612: What advice do you have for aspiring artists? Steph: My advice to aspiring artists is: If you can do anything else, do it. But if art is who you are and there isn’t anything else you can/want to do, then make art. It may not always be great art (some of it will be really bad), but make it anyway. Many plants hang in Steph's studio right beside the huge windows in The Mill. 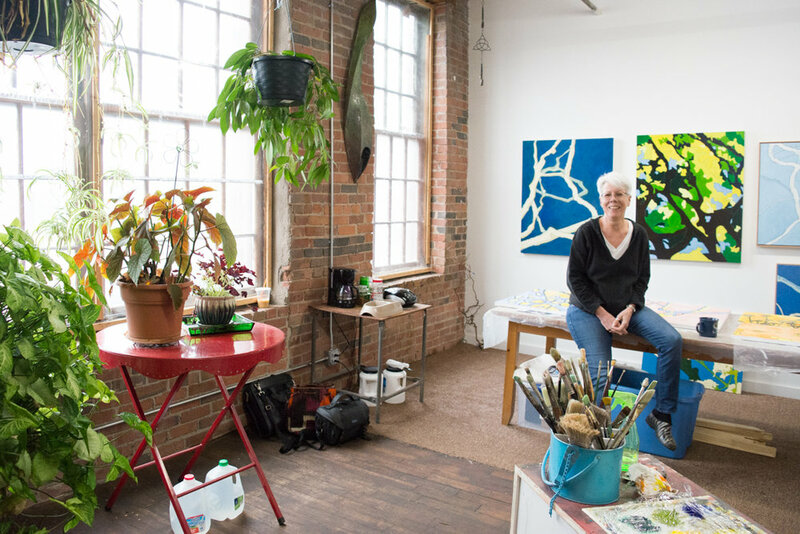 Her plants often show up abstracted in her paintings. Project 1612: Do you have anything coming up you would like everyone to know about? Steph: I will be exhibiting at Ear in the Envelope (Peoria, IL) in August 2018. Project 1612: What are your thoughts on the art community in Central IL? 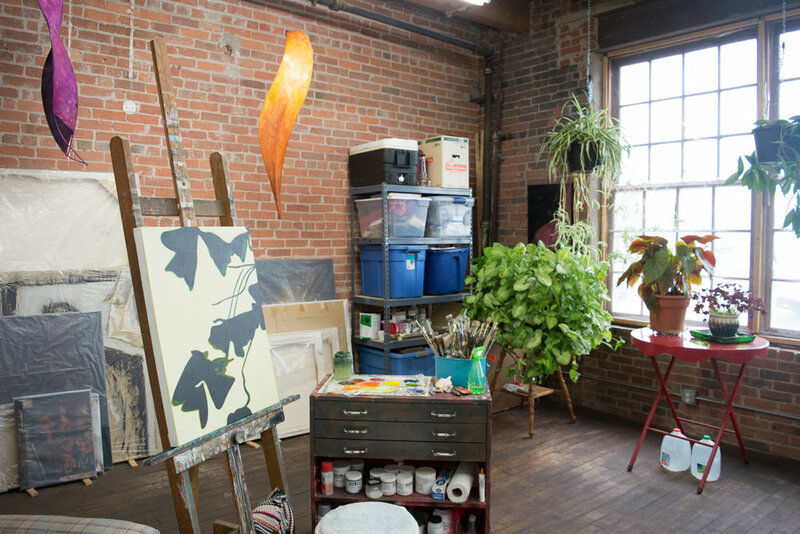 Steph: The art community in Central Illinois is more diverse and larger than most people realize. I am constantly amazed at the depth of creativity, the quality of artistic practice and collaboration opportunities available in Central Illinois. Steph sitting on her studio table surrounded by paintings and plants. Steph Van Doren is an artist working in Peoria, IL. More work can be found on her website here.